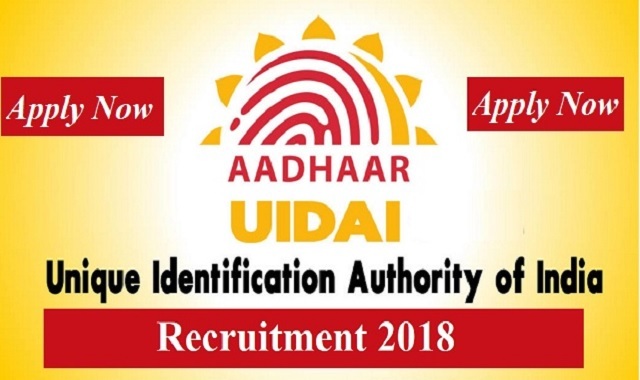 UIDAI Career Jobs Opening 2018-2019 Deputy Director Posts Download Application at www.uidai.gov.in. UIDAI Job has Recently Announced 2018 regarding Deputy Director & Various Job Openings Interested and Eligible Candidates can Download Application Through Official website. UIDAI Hiring for Any Graduate/PG || Deputy Director @ Bangalore - Apply Online. iii) With six years regular service in posts in the Pay Band of Rs. 9300 – 34800 + Grade Pay of Rs.4800/-. 5 year experiences in Administration /Accounts & Finance/Budgeting/ Establish -ment/ Legal/ Procurement/ Planning and Policy formulation of Govt. schemes and projects. The maximum age limit for appointment on deputation shall no exceed 56 years as on the closing date of receipt of application.